During the Spring Festival travel rush, China Railway Nanning Group Co., Ltd. will provide 299.5 pairs of passenger trains, among which 247.5 pairs are bullet trains. While so many trains provide convenience for passengers, they will also bring challenges for the operational security of signal equipment. Therefore, workers must work overnight during operation of trains to detect and prevent any problems and maintain the well-functioning signal system. Accordingly, Nanningdong Railway Station is a hub in Guangxi. 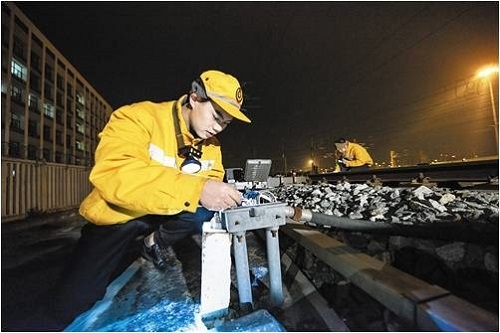 24 young workers from the Signal Department of the Nanningdong Railway Station in the communication and signaling section of Nanning have been undertaking heavy responsibility to maintain and fix nearly one thousand devices in the Nanningdong Railway Station, Wutang Station and Yangwu Station. These workers who are under 35 years old work hard to ensure safety for passengers. Since they have to work at intervals of operations of trains, their working hours mainly last from 0:30 to 4:30 a.m. That is why they are called "Defenders Working at Night" on the high-speed railways.